The final qualifying list for the 2018 Youth Olympic Games will be known in a few weeks’ time and hundreds of teenage athletes across the continents are still chasing their dream of competing in Buenos Aires in October. With ranking points still at stake, the final opportunity for athletes to improve their qualification prospects took place in Tbilisi, Georgia during the 2018 European Cup Georgia Open. Sixty-six athletes from 19 countries across four continents (Asia, Africa, South America and Europe) travelled to Tbilisi along with more than 100 delegates, and the event was held in the Digomi Olympic Village. As with all Under-19 competitions, the Tetrathlon format was used and athletes from three continents featured on the podium. Viktoriia Novikova of Russia won the Women’s Under-19 category ahead of Ekaterina Tareva of Kyrgyzstan and Iuliia Sergeeva (RUS). 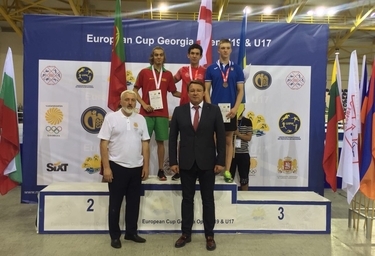 The Men’s title went to local athlete Gaga Khijakadze of Georgia, with Eduardo Oliveira of Portugal winning silver and Yevhen Ziborov of Ukraine taking bronze. There was also an Under-17 category, where Alexandria Klopper of South Africa and Alexander Barbashov (RUS) took the honours. Viacheslav Malishev, UIPM Executive Board Member for Development, said: “I’m very happy to see record numbers of participants among young pentathletes, coaches, and parents in the Youth Olympic Games qualification competitions and U17 international events in 2017 and 2018. The 3rd Youth Olympic Games runs from October 6-18 in Buenos Aires (ARG) with three Modern Pentathlon competitions (Men’s Individual, Women’s Individual and Mixed Relay) taking place on October 12-14 and 16. Three senior Olympians from the pentathlon world will be involved. Women’s Olympic champion Chloe Esposito (AUS) will play the role of Young Change Maker in the Australian team, while Yane Marques (BRA) and Charles Fernandez (GUA) have been appointed by the ICC as Athlete Role Models.